Sophie--now Catherine, Grand Duchess of Russia--had a tough first year at Imperial Court. Married at sixteen to Grand Duke Peter, heir to the throne, and settled in their own palace, things start to look up. As a new day dawns, Catherine thinks only of securing her future, and the future of their country, during one of the greatest political upheavals of her time. Fighting desperately against forces that try to depose the Empress Elizabeth and put the young Prince Ivan on her throne, Catherine soon finds herself in the middle of a war brewing between her beloved Prussia and her new empire. While navigating the fragile political landscape, she quickly realizes that she has only begun to discover the tangled web of deceit and infidelity woven over the lavish court of Oranienbaum Palace. When a strange and delicate alliance forms between the young couple, Catherine glimpses a future of happiness, only to see it vanish at the hands of those who still seek to end her life--and prevent her reign. Out of favor with the empress and running out of options, Catherine must sacrifice her own innocence on the altar of Russia if she is to save the nation and herself. To survive, she will have to do the unthinkable, betray those closest to her and become something greater and more dangerous than she ever imagined she could be... a queen. Gr 9 Up--This sequel to "Queen of Someday" (Clean Teen, 2014) is a breezy romance with a thick historical veneer. The author clearly states that she plays fast and loose with historical details and dates. This allows readers to be swept along by the story and not be bothered by the accuracy of events or dates. Grand Duchess Catherine of Russia--the future Catherine the Great--has come a long way since her days as a minor Prussian princess. At the Russian royal court, she must navigate the complexities of court life to keep her hopes of ruling Russia alive. She falls in and out of favor with the empress, who treats Catherine as a pawn useful only for producing an heir. Her marriage to Grand Duke Peter is a sham, mostly due to Peter's completely reprehensible behavior. He is childish and mercurial, which endears him to no one. Catherine comes across as intelligent, brave, and resilient, despite her cruel circumstances. She often sees herself sacrificing personal character for the greater good of Russia. The story moves quickly, and the characters use modern, casual dialogue. Because the author is so straightforward regarding her use of authorial license, historical details blur together. Ficklin does stay true to the large sexual appetites of her historical figures--there are a great number of sexual situations. 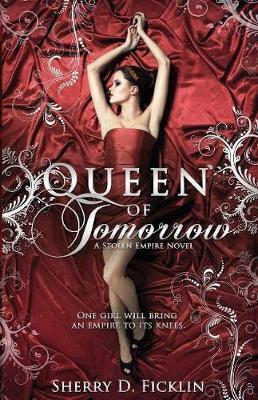 VERDICT "Queen of Tomorrow" should please many romance lovers and fans of the TV show, "Reign," but avid historical fiction readers will find it disappointing.--"
--Lisa Crandall, formerly at the Capital Area District Library, Holt, MI "School Library Journal "
Sherry is a full time writer from Colorado where she lives with her husband, four kids, two dogs, and a fluctuating number of chickens and house guests. A former military brat, she loves to travel, eat exotic food, and meet new people. She can often be found browsing her local bookstore with a large white hot chocolate in one hand and a towering stack of books in the other. That is, unless she's on deadline at which time she, like the Loch Ness monster, is often only seen in blurry photographs.